One of the coolest things about facial hair is that it can completely alter a guy’s appearance. Guys can easily change up their look by shaving or letting it grow out a bit. Those with sensitive skin may have a harder time dealing with their facial hair. Shaving can become a tricky task that only leads to rashes. Of course, you can always opt to grow your beard out and use a beard trimmer, which is less irritating on the skin compared to a razor. However, if you are looking to get rid of it all for a clean look, shaving isn’t your only option. Hair removal creams are a great alternative to shaving. Guys with sensitive skin can ditch their razors and become hair free without any pain or irritation. These creams are simply applied to the skin and wiped away. As it sits on your skin, the ingredients in the cream work to remove the hair at the root. That being said, everyone’s hair and skin is different. Before going out and buying the first cream you see, you should understand its ingredients and how it works to ensure that it’ll be effective for you. Essentially, hair removal creams work by altering the protein structure of the hair. These protein structures, called keratins, give hair its shape and strength. When covered in hair removal cream, or depilatories, the hair becomes incredibly soft and mushy. This allows it to be removed along with the cream. This can be done with a wipe of a cloth or a rinse in the shower. To get the job done, these creams contain a number of alkaline chemicals. Sodium thioglycolate, strontium sulfide, and calcium thioglycolate are the main ingredients that aid in removal. They work to dissolve keratins and remove your hair from the follicle. These ingredients are the most common in hair removal creams. In fact, they are responsible for the strong and instantly recognizable smell that most creams have. Do Hair Removal Creams Really Work? Ultimately, the effectiveness of a hair removal product varies. One product may work fantastically for one person while being ineffective on another. Different formulas and ingredients can react differently to your hair and skin. When choosing the right hair removal cream, you should take the ingredients into consideration. Not only that, but you should try different brands until you find one that is effective on your skin. One of the biggest advantages to using these creams is that they are painless. When compared to regular shaving or waxing, hair removal creams are pain-free. Guys with sensitive skin can opt to get a cream that is formulated for their skin. They will contain gentle chemicals and even help to moisturize the skin while removing hair. Instead of dealing with rashes on a regular basis, guys can go with a soothing cream to get rid of their facial hair. A cream will remove hair from the follicle, resulting in a stubble-free feel and appearance. This is a unique hair removal cream that is actually designed for your head. 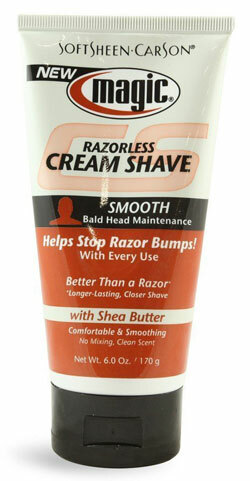 It is a popular choice among bald men who want to keep their head smooth and irritation free. It is also a great choice for your face. It has a number of beneficial ingredients to keep your skin soft. It contains a skin conditioning complex to prevent any irritation, making it a prime choice for guys with sensitive skin. The formula has mineral oil, shea butter, jojoba seed oil, olive fruit oil, and aloe to soothe and moisturize the skin. As for hair removal ingredients, this cream contains thiogycolic acid and calcium hydroxide to remove hair from the follicle. It removes hair from deep within your skin, resulting in smooth appearance that will last much longer than shaving. This hair removal cream contains a number of great natural ingredients to keep your skin soft and moisturized. It’s a great option for guys with sensitive skin. It contains aloe vera, green tea leaf extract, fruit extract, and vitamins A and E.
This anti-oxidant complex actually leaves your skin in better condition than before. The cream introduces vitamins and healthy ingredients into your skin to leave it smooth, rejuvenated, and hair free. 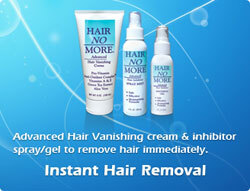 The Hair No More Vanishing Cream also penetrates deep into the skin to remove hair at the root. In the process, it exfoliates dead skin cells to leave your skin soft. The vanishing cream is actually a part of a set of products. Should you choose to use the accompanying inhibitor in this line, you can expects to have a hair-free face for months at a time. Always wanted to try this but have not had the nerve — frightened by the irrational belief that it’ll burn my skin. I have a medium-strength beard, so I also fear that it just won’t work on me. This article is very reassuring and it’s great to have some recommendations about specific products to try. Thanks!